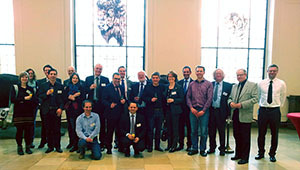 Archiv der Regionalgruppe Köln-Bonn - Deutsche Gesellschaft der Humboldtianer e.V. On Saturday October 20th, 2018, the Regionalgruppe Cologne/Bonn of the Deutsche Gesellschaft der Humboldtianer invited all Humboldt alumni and current fellows to a guided tour through the Archeological Site Cologne and the upcoming MiQua Museum in the historic center of Cologne. We (i.e. 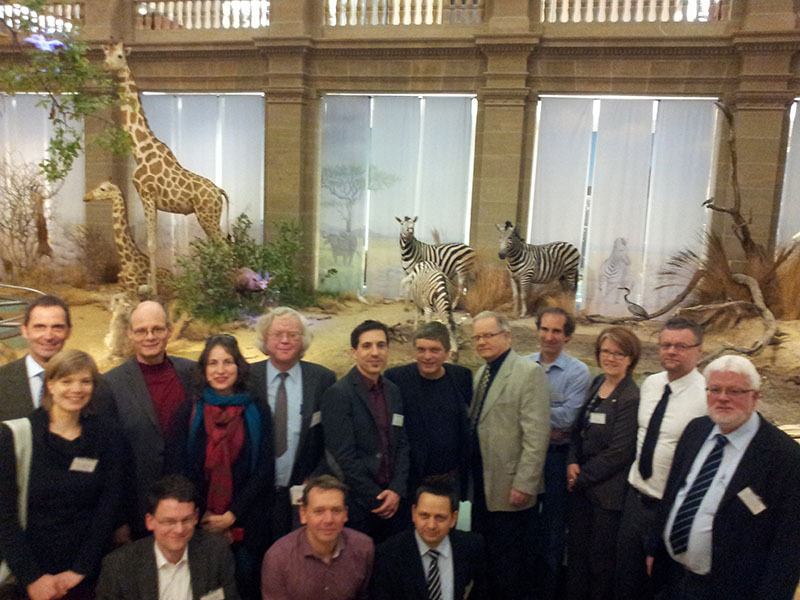 37 participants) were welcomed at 3:00 pm at the Praetorium by Dr. Thomas Otten, Direktor MiQua. 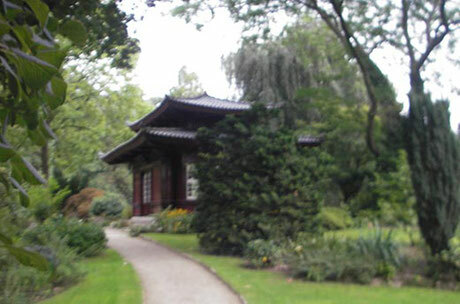 MiQua is the “LVR-Jüdisches Museum im Archäologischen Quartier Köln”. We went „with the elevator down to Roman times“ to the relicts of the Praetorium, the palace of the Roman governor. With deep knowledge about the historic building as well as the several excavation campaigns, Dr. Otten could create a vivid picture of Roman time Cologne. Adjacent to the palace we could also visit a real Roman time water channel, now lying 8 m deep under today’s surface. And finally we got a glimpse on the construction area of the MiQua museum, which will combine the Roman time relicts with recently excavated medieval, mostly Jewish objects and the restored 12th century Mikwe. Dr. Otten described the future concept of the Museum and everybody is now looking forward to the grand opening of the museum in 2021. At 6:00 pm, we joined for dinner at the Italian restaurant “Via Sistina” to continue our discussions and exchanges on various topics. 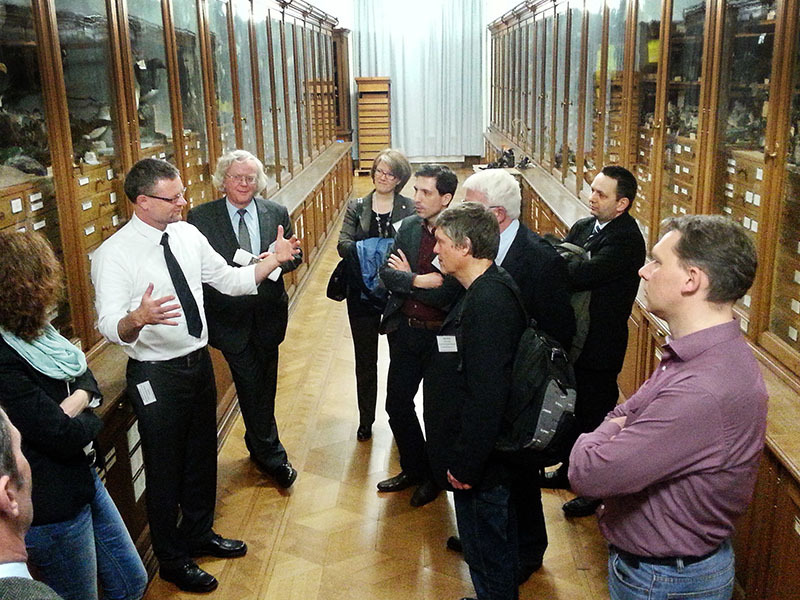 This year we organised a visit to the Bayer communication center at Leverkusen. 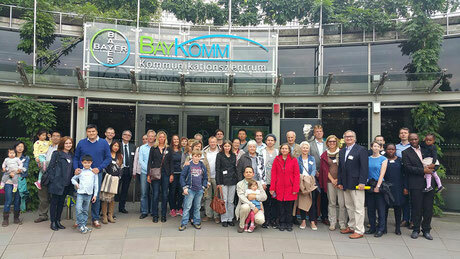 About 50 alumni and fellows and their families from Aachen, Bonn, Cologne and Düsseldorf took the opportunity to meet members of the "Humboldt-family". The guided tour through the Bayer product exhibition stimulated the discussion that was continued during the walk in the adjacent Japanese Garden. And of course the conversation deepened as the evening proceeded with fine food and drinks in the Kleinen Saal of the Große Kasino. 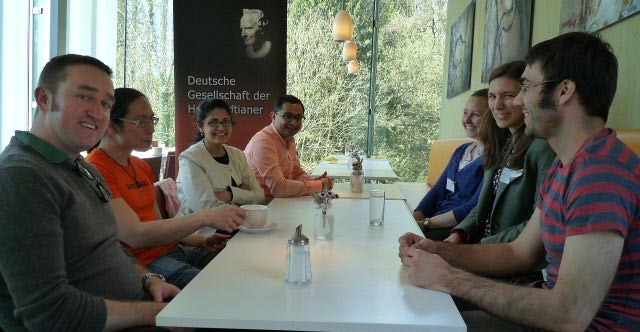 In the end, all participants agreed that these open meetings are invaluable and important to strengthen the international and transdisciplinary network of the Humboldt family. 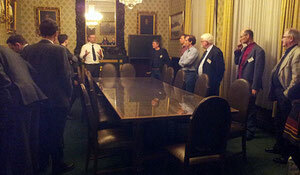 By the end of the day, it was time to say farewell, but invitations for future meetings were already issued. 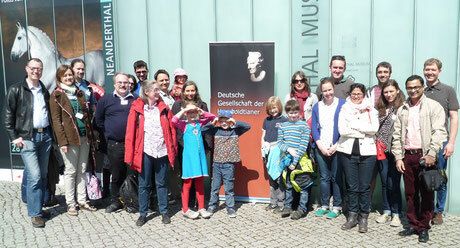 The alumni and fellows of the regional group "Aachen-Bonn-Cologne" and their families visited the Neanderthal Museum in Mettmann (external link). It was a wonderful and sunny day we spend together. 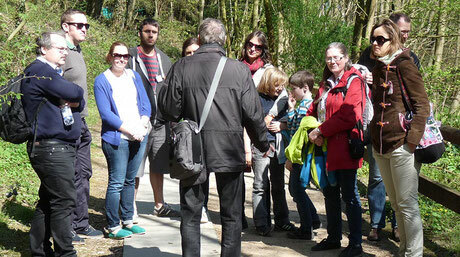 Two enthusiastic guides took us on an exciting journey from the very beginning of human origin to our way to Europe. 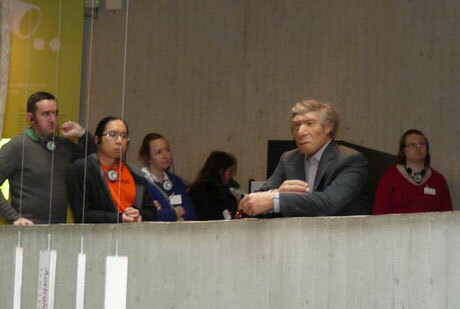 The impressive exhibition covered the theoretical framework to learn more about human evolution. 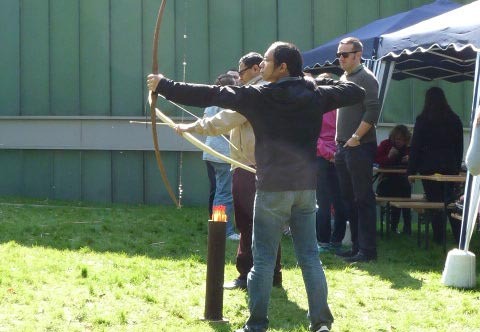 While outside we learned in a practical workshop how to make fire with Amadou, wood chips, flint, pyrite and patience and how skilled our ancestors must have been in archery and spear-throwing to survive in the past. Luckily, we did not depend on our new learned stone-age skills, the museum's restaurant prepared leek soup, excellent lasagne and long turkey nuggets in sauce for lunch. In the afternoon, some of us took the opportunity to visit the "original" place where Homo sapiens neanderthalensiswas discovered in 1856. We learned more about the peculiar circumstances of the findings and the fundamental dispute that followed the hypothesis of a human ancestor, contradicting religious doctrine at that time. By the end of the day, we had an exciting interactive day with many talks in the typical inspiring and friendly Humboldt-atmosphere. Our first summer family festival started in the afternoon of June 21st, 2014 on the banks of the river Rhine. Prof. Dr. Hartmut Arndt opened the doors of the swimming research laboratory of the Ecological Rhine Station of the University of Cologne for our members, recent fellows, award winners and their families. While small groups were guided through the labs and learned more about the Chinese mitten crab, other invasive species and dynamic succession of biofilms, others discussed and enjoyed the sunny weather. Right next to the Rhine Station, we setup up a pavillon and tables for refreshments, finger food and a lovely BBQ. The small family members occupied the river bank and spend their time on chalk paintings/drawings, artistic juggling or blew soap bubbles. The casual atmosphere was so enjoyable that time flew by and we are looking forward to meeting again soon. Die Gründungsveranstaltung der Regionalgruppe "Köln-Bonn" der Deutschen Gesellschaft der Humboldtianer e. V. fand am 26. März 2014 fand auf Einladung von Dr. Viehberg und Dr. Karbe im Hörsaal des Forschungsmuseum Koenig, Bonn, statt. Mit tatkräftiger Unterstützung von Prof. Dr. Misof standen die Räumlichkeiten für das erste Treffen der Alumni der Alexander-von-Humboldt Stiftung offen. Mit Gästen der Universitäten Bonn und Köln und Vertretern der Stiftung startete die Initiative erfolgreich. Nach einer kurzen Begrüßung der Teilnehmer durch Dr. Viehberg, hieß Herr Prof. Dr. Misof die Teilnehmer im Forschungsmuseum willkommen. Der Präsident des Humboldt-Clubs, Prof. Dr. Uwe Dorka, stellte konkrete Ziele der Gesellschaft vor. Ein Schwerpunkt wurde besonders herausgearbeitet, die Bedeutung der Regionalgruppen, denn die flächendeckende Erreichbarkeit ermöglicht es, auf lokaler Ebene Ansprechpartner für die verschiedenene Aufgaben zu haben.